Manufactured in 0.9mm thick steel. 2-point lock ensures access is restricted to authorised personnel only. Spillages drain into a liquid tight, 80mm deep, removable sump tray. Includes fully sealed base to prevent leaks at ground level. Will withstand the early minutes of exposure to fire. Provided with GHS COSHH flammable label. High visibility epoxy powder coated yellow finish. Conforms to COSHH, Health and Safety Executive Guide HSG51 and DSEAR 2002. 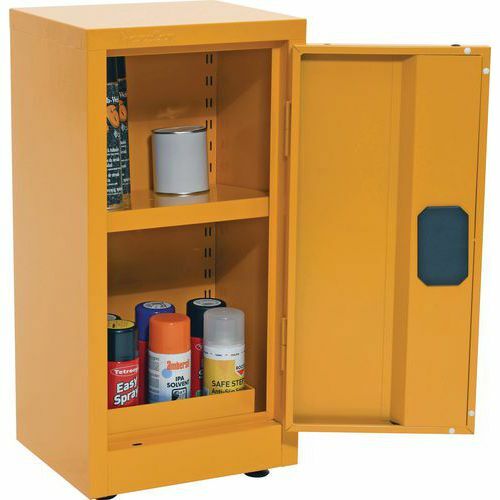 Single door cabinet with leak proof sump for safely storing and segregating flammable substances.